This compilation of Raging Swan Press’ critically-acclaimed and well-received Village Backdrop-series is a massive 89 pages long, 1 page front cover, 2 pages of advertisement, 2 pages of editorial/foreword, 1 page ToC, 1 page SRD and 1 page back cover, leaving us with 81 pages of content – so let’s get this on, shall we? Okay, first things first: This is NOT the same book as Village Backdrops I for Pathfinder! Instead, we have a different compilation on our hands. This is evident pretty much from the get-go, with a different page-count – but also with a slightly different organization and villages featured. 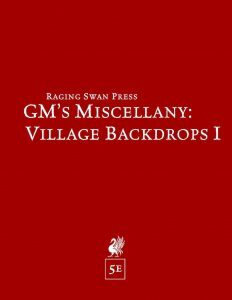 The book, for example, begins with a brief chapter that should provide a helpful guide for GMs and prospective designers alike to make compelling villages, going through the process step by step, often with random tables to roll for sample names, general events to flesh out, etc. More importantly, the book notes important aspects from industry to history to contemplate and can help a GM keep his/her focus while designing. From basics like conflicts, flavor etc. to tables to determine government, alignment, prominent features, industry, population, notable buildings, conflicts and secrets, to 100 sample village names, 20 generic events and even 20 traditions, we essentially get all the tools to create iconic villages on the fly. This section really helps cutting down preparation/design-time, so kudos! From there, we move on to Black Wyvern (which is easily the most boring of Raging Swan’s pirate-centric villages, alas) and then to the aptly-named, amazing Bleakflat. Coldwater, with its weird, deformed populace and evocative Kingsfell. Lanthorn, with its eponymous magical lights can also be found – and would be as well a place as any to note that, while it does sport a market place section, not all villages have one. Similarly, the magical lanterns that lend this place its unique flair could have used some mechanics, as far as I’m concerned – the conversion of the crunchier bits falls by the wayside here and there…though e.g. the magical drugs in Suurin are properly covered. Even then, the pdf has some real gems to offer – like Mike Welham’s rather amazing village of kinda friendly undead…oh, yeah, there’s this nasty curse-thingy going on…never mind that, all right? 😉 Kidding aside, oddly, this one doesn’t get a marketplace section either. If you require a more in-depth break-down of the villages in question, please consult my individual reviews for their installments. Editing and formatting are very good – I noticed no undue accumulation of hiccups. Layout adheres to a neat two-column B/w-standard that is easy on the eyes and printer-friendly. The pdf sports an impressive array of great b/w-artwork and the cartography provided for the respective villages is amazing. As a pdf, the book comes in two versions, with one being particularly printer-friendly and one optimized for screen-use. The pdfs come fully bookmarked for your convenience. I cannot comment on the print version, since I do not own it. Creighton Broadhurst, Richard Green, Marc Radle, Jeff Gomez and Mike Welham are all talented writers – that much is evident at first glance when reading the intriguing villages collected in this compilation. The villages, in short, adhere to Raging Swan Press’s high quality standards and all have several unique angles to use in the game. That being said, I am not 100% satisfied with the 5e-conversions in all of them – the missing plague, for example, and the inconsistent supplemental material provided can make for valid reasons to complain against this compilation – basically, the weaker aspects of the original files have not been overhauled for this. That being said, this is still a more than worthy offering; there is a lot of amazing gaming material herein. My final verdict will hence clock in at 4.5 stars, though I feel I have to round down for this one. You can get this neat compilation here on OBS!